Tumour necrosis factor (TNF), a messenger substance in the immune system, plays an important role in triggering chronic inflammatory diseases. For this reason, TNF inhibitors are a standard form of treatment for patients with rheumatoid arthritis and certain inflammatory bowel diseases. However, TNF also protects against infection, which means that inhibiting it can cause latent infections to resurface. Researchers have been investigating how TNF protects against infection for many years. 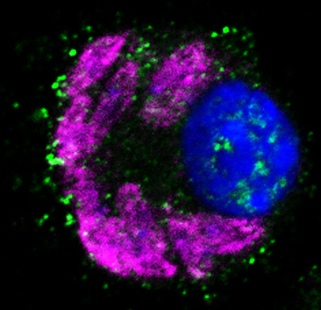 In collaboration with researchers from Erlangen and beyond, a working group led by PD Dr. Ulrike Schleicher and Prof. Dr. Christian Bogdan at FAU’s Institute of Microbiology – Clinical Microbiology, Immunology and Hygiene has now discovered a new mechanism via which TNF protects against intracellular pathogens that cause infection. In order to defend the body against intracellular pathogens, such as the single-cell parasites Leishmania major, nitric oxide (NO) must be produced. This is formed in macrophages and other phagocytes through type 2 NO synthase (NOS2). However, the function of NOS2 is inhibited by a competing enzyme called arginase 1. The researchers demonstrated through cell culture experiments and an infection model that tumour necrosis factor inhibits arginase 1 synthesis, which depends on the messenger substance interleukin 4. This causes nitric oxide production to increase and suppresses the pathogens. The results of the study, which was partially carried out in the framework of FAU’s Interdisciplinary Centre for Clinical Research and DFG Collaborative Research Centre 1181, have recently been published in the international journal Cell Reports.